Introducing our new, small gas insert, the 31 DVI. 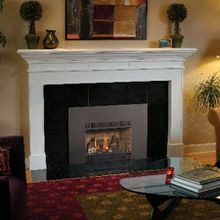 This insert represents a new direction in gas heating that offers you a top-quality gas fireplace insert at an affordable price. The 31 DVI is all about basics: a big, beautiful, brightly glowing fire and a simplified operating system, yet offering the same glass viewing area as the top selling Fireplace Xtrordinair Model 32 DVS GreenSmart gas insert. The 31 DVI features the Dancing-FyreTM split-flow, burner and IPI electronic ignition that allows you a great fire display and a “green” money saving solution to home heating.